WHERE heritage is concerned, the shady trees of Penang rarely garner much attention unlike historical buildings, artefacts and documents. To appreciate the value of our trees, a group of researchers with backgrounds in ecology and botany have teamed up to produce a book entitled ‘Heritage Trees of Penang’. Three minds are better than one: (From left) Gardner, Pindar and Lai going through their research for a book titled 'Heritage Trees of Penang' which will be out in December this year. The three collaborators — Simon Gardner, Pindar Sidisunthorn and Lai Ee May — have received a RM40,000 grant from the George Town Grants Programme, to be used to supplement the book’s printing cost for 3,500 copies. Started last December, the two-year programme is a RM20mil seed-funding initiative by Think City Sdn Bhd, a wholly-owned subsidiary of the Federal Government’s investment arm Khazanah Nasional Bhd, for urban rejuvenation projects within the George Town World Heritage Site. Heritage outlook: The cover of 'Heritage Trees of Penang'. The book is now in the pre-final stage and is set to be published by Areca Books in December. It will be a 400-page, coloured hardcover edition, priced at RM99. Divided into six parts — street trees, garden trees, sacred trees, village trees, forest trees, and coastal trees — it will feature over 200 species found in Penang island. The book will also include over 1,200 photographs and 70 original watercolour painting illustrations by writer and researcher Pindar Sidisunthorn. Pindar’s husband, Simon Gardner, who is also a writer and researcher, said they began working on the project in 2007 and it took them two and a half years to complete it. “The book has descriptions of the trees and their uses as well as their historical and religious connotations,” he said in an interview. 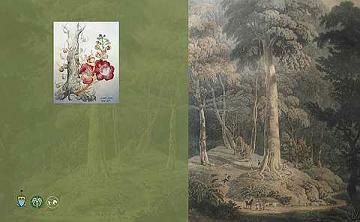 Gardner, 44, said the book cover’s would be graced by a painting called ‘The Great Tree’ by William Daniel. “The tree existed until the year 1870. We chose that particular painting because it presented a historical and heritage outlook, which goes well with its contents. “It’s a significant tree but its name remains unknown. There were many different guesses though none were confirmed,” he noted. He added that the tree could be more than 50m tall, with its girth measuring nine metres and the lowest branch hanging about 35m from the ground. It used to be called a milk tree because it exuded white latex, he added. Pindar, 41, said a multitude of trees were covered in the book. So huge: The largest angsana tree which is found in front of the Penang Hospital. “Some of them dated back to the 19th century. For example, the oldest street tree recorded in Penang is the ‘sentang’ or Azadirachta excelsa. This wild tree which used to grow in the forest, has been around since 1820. 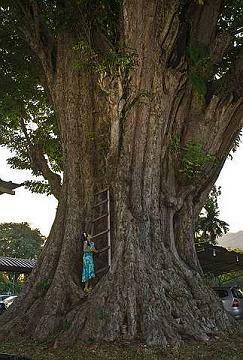 “Another example is the largest angsana tree found in front of the Penang Hospital,” she said. Gardner added that the angsana trees were planted in Penang, Singapore and Malacca circa 1802. “But the majority of these trees in Singapore and Malacca were killed by a disease in the 1920s. Now, Penang has the best and oldest collection of angsana trees,” he said. Lecturer Lai Ee May, 33, said she met Gardner and Pindar in 2007 through mutual contacts and they decided to team up for the book project. “We asked over 10 individuals including experts from the Forest Research Institute of Malaysia (Frim), Universiti Malaya (UM), Penang Heritage Trust (PHT) and Malaysia Nature Society (MNS) who are specialists in botany and local heritage to review our book. We also had non-experts to share their opinions. “They offered suggestions and comments that were taken into consideration. But in general, people were happy about the book. “We’d also like to thank SERI Centre for Habitat and Environment committee chairman, Datuk Dr Leong Yueh Kwong who contacted Think City on our behalf for the grant application,” said Lai, a researcher at the Royal Botanic Gardens in Kew, London. Gardner said Penang was special and it had natural, historical heritage. “When we talk about heritage, it’s usually about the buildings. We have to realise that trees are also part of the heritage in Penang,” he said. Pindar echoed similar sentiments, saying it was important to look at the environmental aspect too. “We believe that this will be the first, extensive book about the trees in Penang,” she said, adding the book would appeal to everyone, especially locals who could recognise the trees in it.